A man is being questioned in the police barracks shooting. 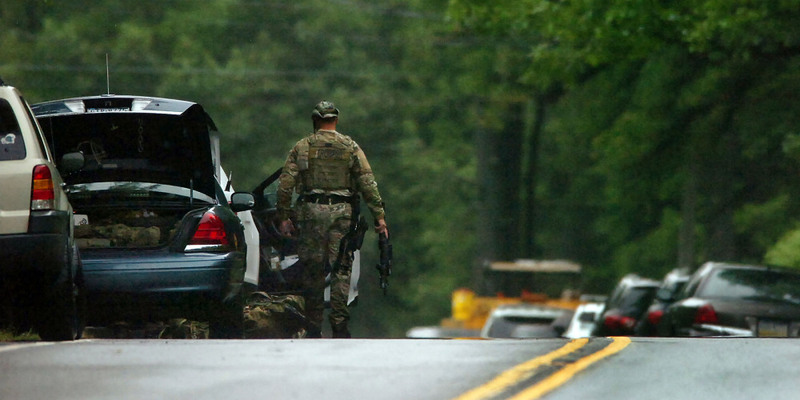 BLOOMING GROVE, Pa. – A late-night ambush outside a state police barracks in Pennsylvania’s rural northeastern corner left one trooper dead and another critically wounded, and authorities scoured the densely wooded countryside and beyond on Saturday looking for the shooter or shooters. State Police Commissioner Frank Noonan said a “very dangerous, armed criminal” eluded quick capture. “It has touched us to the core that such a thing could happen,” Noonan said. Police interviewed a man they called a “person of interest,” but Noonan said authorities are talking to hundreds of people as part of the investigation. He stressed the man is not a suspect. Gov. Tom Corbett ordered all Pennsylvania flags at state facilities to fly at half-mast and said he was praying for the slain trooper’s family as well as the injured colleague. He canceled all campaign appearances for the day.